Originally uploaded by tapescraper Click on the pic to see the whole photo series. I bought a 600 pound lump of cast iron a couple of weeks ago, and had to move my new friend Jacques to a storage unit until I figure out where he will live and be useful. 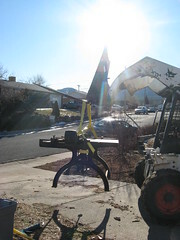 After consulting with Kevin Auer and Bill Minter, I opted not to do as they recommended, which was to remove the blade and counterweight and then let 4 guys pick it up by hand and move it. No, I hired a guy with a forklift and a lift-gate truck, and left it all intact. That left me and 3 guys to supervise and annoy the forklift guy. If anyone needs a forklift guy in Colorado, let me know and I’ll give you the referral – he was great! Here’s a quick tip: before you tell the fork lift guy to come on down, measure WITH A TAPE MEASURE, rather than guessing by using your body and raised arm, the height of the garage door the fork-lift has to fit through. I was lucky by about a half-inch. Next, make sure the pallet on which the beast has been resting for the past 20 years will not collapse. Again, lucky. I will be reinforcing that sucker before we move it again, that’s for sure. Also, have some chain handy to drag the pallet out of the garage, and some straps to give the forklift something to hook onto instead of the actual iron. Guess what…lucky again…they had some extra laying around. For someone who generally plans out everything well in advance, I didn’t think this through as well as I could have, having no concept of what would be required. If anyone else has to do this, feel free to contact me. I’ve got to move it one more time, and by then I’ll have it down. One more thing...The Guild of Bookworkers loans and sells a dvd, Examination of the Jacques Board Shear. William Minter, 2000. I plan on getting my hands on it soon. I’m jealous. We were offered the choice of two very beat up board shears when our local bindery was shut down but said no. We went with the largest size Kutrimmer – which is nice – but it is no Jacques.